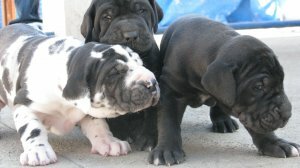 We have a litter of 2 Black, 4 Harlequin and 6 Fawn show quality great dane boys and girls for sale. The sire and dam, who have excellent lineage and wonderful temperaments, are our much loved pets. These little crackers show great promise of becoming stunning big danes. - Age around 52 days. - life time breed guarantee. - Be fully wormed and vaccinated. -We take care of delivery for all over India. Transportation charges free. - After sale phone / e-mail support available.